Very rare map of Bermuda, the most sophisticated in its day..
A scarce and important map of Bermuda issued in 1868 by Alexander Findlay. Based upon the model laid down by C. Lempriere and Robert Sayer in 1775, this map details the island of Bermuda and its surrounding reefs. Laurie acquired Sayer's stock in in 1794 and subsequently began reissuing the map in various updated formats. The present fully re-engraved map is vastly more sophisticated than the original 1775 chart due to later surveys by Captains T. Hurd, E. Barnett, and J. Evans. The present map details the reefs in particular with extraordinary detail and ads two large insets, one in the upper right focusing on the 'Bar and Harbour of St. George' and another in the lower right detailing the 'Narrows and Murray Anchorage.' Findlay has also added a dramatic view in the lower right quadrant illustrating vicinity of St. George. There are also considerable advances with regard to island topography, countless additional soundings, and navigational annotations. 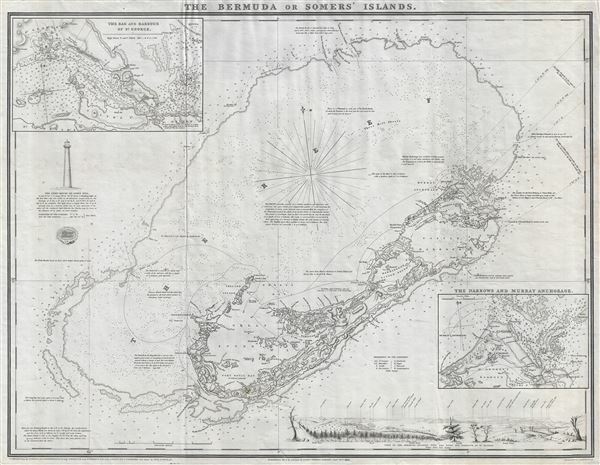 Findlay prepared this map to accompany his pilot book entitled A Description of the Bermuda or Somers' Islands, with nautical directions to accompany the Chart, this being the 'chart' in question. The first edition of Findlay's pilot book appeared in 1847 and this map appeared with it. The only known surviving example of this edition is held in the repository of the British Library. The present example is a later edition updated to reflect new survey's and discoveries in the middle part of the 19th century. In its day, this was the finest and most sophisticated nautical chart of Bermuda available and would have been invaluable to anyone involved in the transatlantic trade with England. Alexander George Findlay (January 6, 1812 - May 3, 1875) was an English geographer and hydrographer active in London during the middle part of the 19th century. Findlay was born in London to the Findlays of Arbroath, Forfarshire, a family long associated with nautical trades. Findlay's father, Alexander Findlay was one of the original fellows of the Royal Geographical Society. The son, Alexander George Findlay, devoted himself to the compilation of geographical and hydrographical works, publishing various nautical works as well as historical atlases. In 1844 he was elected a fellow of the Royal Geographical Society. Most of Findlay's early nautical work was completed in association with the London geographical and print publishing firm of Laurie and Whittle. Following the 1858 death of Richard Holland Laurie, Findlay took over the business, republishing many updated versions of established charts well into the late 19th century. Laurie and Whittle (fl. 1794 - 1858) were London, England, based map and atlas publishers active in the late 18th and early 19th century. Generally considered to be the successors to the Robert Sayer firm, Laurie and Whittle was founded by Robert Laurie (c. 1755 - 1836) and James Whittle (1757-1818). Robert Laurie was a skilled mezzotint engraver and is known to have worked with Robert Sayer on numerous projects. James Whittle was a well-known London socialite and print seller whose Fleet Street shop was a popular haunt for intellectual luminaries. The partnership began taking over the general management of Sayer's firm around 1787; however, they did not alter the Sayer imprint until after Sayer's death in 1794. Apparently Laurie did most of the work in managing the firm and hence his name appeared first in the "Laurie and Whittle" imprint. Together Laurie and Whittle published numerous maps and atlases, often bringing in other important cartographers of the day, including Kitchin, Faden, Jefferys and others to update and modify their existing Sayer plates. Robert Laurie retired in 1812, leaving the day to day management of the firm to his son, Richard Holmes Laurie (1777 - 1858). Under R. H. Laurie and James Whittle, the firm renamed itself "Whittle and Laurie". Whittle himself died six years later in 1818, and thereafter the firm continued under the imprint of "R. H. Laurie". After R. H. Laurie's death the publishing house and its printing stock came under control of Alexander George Findlay, who had long been associated with Laurie and Whittle. Since, Laurie and Whittle has passed through numerous permeations, with part of the firm still extant as an English publisher of maritime or nautical charts, 'Imray, Laurie, Norie and Wilson Ltd.' The firm remains the oldest surviving chart publisher in Europe. Findlay, A., A Description of the Bermuda or Somer's Islands, with Nautical Directions to Accompany the Chart, (London: Laurie) 1868. Very good. Some creasing. Else clean. Palmer, Margaret,The Mapping of Bermuda: A Bibliography of Printed Maps and Charts, 1548 - 1970, page 13. British Library, Map Collections, BLL01004803647.